There is a proactive, effective method of monitoring the entire body for early warning signs of disease. Unnatural heat present in the body has been of interest to mankind since ancient times. Early Greek medical practitioners realized that the presence of elevated heat levels being emitted from the skin was indicative of some underlying problem. Thermography is a system that measures the heat from the body and reproduces it as colored images. These images can then provide valuable information to health practitioners, especially those who value a healthcare model and strategy of wellness and prevention. Thermography is a safe and effective option for the progressive patient who desires a proactive modality for monitoring and caring for their health, without exposure to radiation, and in the case of mammograms, compression of sensitive body tissue which can cause further trauma to the area of concern. In full body thermography a digital thermographic camera differentiates between miniscule variants of heat within the body’s areas and reproduces them as an image that is unique to each person. The images are like a signature that is relatively constant and repeatable over a period of time. As a preventive health screening full body thermal imaging can point to indications of disease or areas in the body that need special attention before serious disease develops. Any physiologic anomaly, such as inflammation and abundance of neo-vascularity concentrated in one area, (which is highly indicative of developing pathology) or a change from the appearance of a scan from year-to year will be reported as an area of concern to be followed up on. Full body thermography cannot “see” organs but can “see” the function and physiology of organ health and can image the visceral cutaneal reflex, which is how things happening on skin are reflective of what is happening underneath the skin. 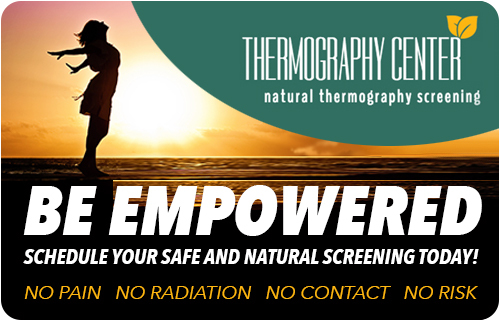 Although not considered a replacement for any test your practitioner has ordered, with the current state-of-the-art-technology, regular full body thermography screening offers a way to see more clearly into the subtle realms of change in the body. Tending to ones health in this manner not only allows a relationship of proactive wellness, but also creates a baseline with which to observe changes over time in a risk and radiation-free environment.